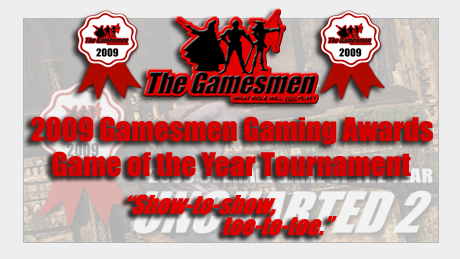 The 2009 Gamesmen Gaming Awards “Game of the Year” Inter-podcast Tournament | The Gamesmen- What role will YOU play? Remember that “Game of the Year” Uncharted 2 Family Night we discussed on The Gamesmen, Episode 23 LIVE? Well, being named the 2009 Overall Gamesmen Game of the Year deserves a much loftier fanfare than a game night. That’s right! Thanks to the brainchild of one Simon DI from BMITV, we’re going “show-to-show, toe-to-toe”! As of this moment, The Gamesmen, The Couchmercenaries, and BMI are involved but other VGhub.net sites with podcasts are welcome to join as well! If you’re a fan of any one particular site and wish to play in the tourney but that team is full, I’m fairly sure that we can either find you an existing slot or create a “B” team. Leave a post here or email TheGamesmenRPG@gmail.com. The tournament will take place on Friday, February 26th and each match will consist of the best of three rounds: (1) Deathmatch, (2) Plunder, (3) King of the Hill.